The ordinance has also been routinely used against the homeless (taking their tents, bedding, clothing and food) and until now only deOccupy Honolulu has mounted a legal challenge to the ordinance. 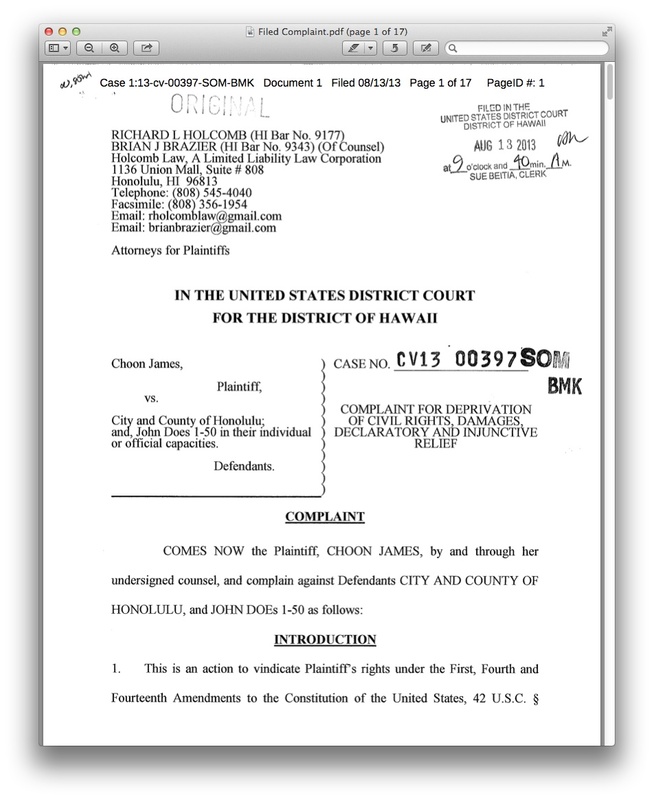 This case (brought by Richard L. Holcomb, the same attorney suing on behalf of deOccupy Honolulu) is particularly interesting because Plaintiff Choon James is neither a sidewalk encamped political radical nor down-and-out homeless. Quite the opposite, she is in fact a Realtor broker with her own firm, cjrealestatehawaii.com. 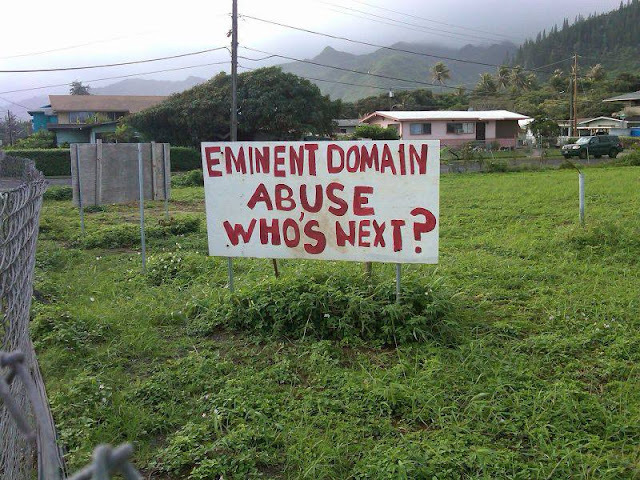 The signs, behind a fence on a nicely mowed lawn, didnʻt demand the Mayorʻs head on a stick, but rather protested what she sees as heavy handed and unjustified use of eminent domain. The City took the signs and hasnʻt returned them. The property is apparently subject to a pending eminent domain condemnation action by the City which wants to move the local firestation there. But according to the Cityʻs own records, James is still the owner, still pays the property tax, and as the Complaint points out still has the property mowed and maintained. The Complaint charges violation of Fourth Amendment rights against unreasonable search and seizure; violation of due process; violation of First Amendment free speech charging the City "interfered with and chilled speech and activities protected by the First Amendment." I liked the term "chilled speech" because itʻs picturesque and also conveys the essence of some of the problem here. 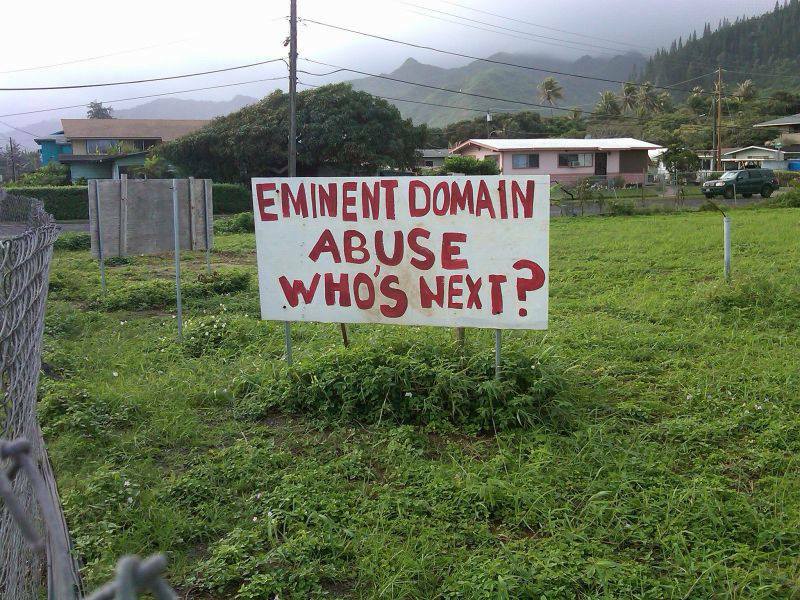 I mean, eminent domain isnʻt one of those issues you see signs about every day. But if we see the City able to load up a bunch of big bodies in a bunch of trucks and tear down signs it doesnʻt like, that certainly does have a "chilling" effect on anyone with a political complaint to air. People will turn a blind eye when a politically radical group gets their signs taken, but will the Federal Court allow the City to tear down signs it doesnʻt like on private property? Update of 8/16/13: Choon James has a well watched show on Cable TV called "Country Talk Story." A recent episode was devoted to the seizure of these signs and the plans and schemes surrounding the proposed firehouse in Hauʻula. I am on the edge of my seat for this. Great reporting, Doug and my best wishes to Ms James on her suit. Do your best not to let these bastards get away with this kind of behavior! The Honolulu City Council and Mayor thinks it legal to throw away sign it don't like on public property. So does this mean it also OK to remove politicians signs? Now that we've filed the lawsuit, somebody is going bonkers again! The Reynolds Recycling on my lot received a call from the Department of Planning & Permitting. Mr. Jerald Toyomura (768-8056) from the Department of Planning and Permitting is threatening to RESCIND their operations permit. Reynolds said this has never happened to them before. Jiro Sumada, Acting DPP Director approved their business permit application on January 29,2013. First the city bullies private property rights, then it bullies free speech signs, now it bullies RECYCLING operators. What about the Outdoor Circle and the ban on large letters?